WVI has just finished a 3 year project with Vincent Wildlife Trust (VWT) translocating pine martens from healthy populations in Scotland to mid-Wales. It is part of VWT’s plan to restore a healthy pine marten population to the rural landscape of Wales and England. Wildlife Vets International (WVI) has provided the veterinary part of the project: being the vet during the planning and execution phases of the translocations. WVI’s epidemiologist, Dr Alex Thomlinson, wrote the Disease Risk Assessment looking at the disease impact of introducing new animals in to an ecosystem. This is in accordance with the IUCN Guidelines for Reintroductions and other Conservation Translocations (2013). Translocations were scheduled for the autumn when females would have conceived but the embryo will not be implanted, nor be lactating or have young around. It is the time when any stresses of translocation would have the least effect.The process of trapping, translocating, pre-release and release were meticulously thought through and protocols adjusted where they were found not to work. By the second trapping season everything worked so well that all the staff involved were hardly completely confident in the process, therefore relaxed, which would have been passed on to the pine martens. Over the three trapping seasons, 51 pine martens have been translocated successfully. More were trapped, all of which were very healthy on inspection. Only adults were taken, ideally proven breeders. Young animals were released where they were trapped, once they had been given a health check and fur, blood and faecal samples had been taken for research. All the translocated pine martens spent a week in a pre-release pen, then the door was open. Human contact was kept to a minimum and the pine martens were tracked using a radiocollar and camera traps. To help them find their feet, food was left out for them initially. This process is known as a soft release. 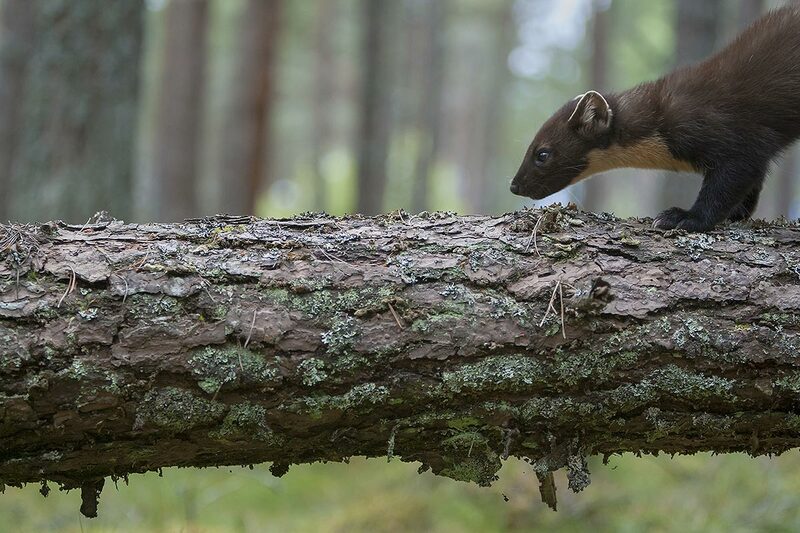 There has been breeding success for both pine martens released in 2015 and 2016 – kits were born that had been conceived in Scotland. Any pregnant females translocated in 2017 will give birth next spring. What is REALLY exciting is that at least one of the females translocated in 2015 has given birth, meaning she must have conceived in Wales – evidence that the pine martens are breeding successfully in Wales. On the technical side, the samples from 2015 and 2016 pine martens were analysed together with information from faecals from released pine martens. The results were used to update the Disease Risk Assessment which was submitted to VWT/the project in June 2017. That is the end of our involvement in that project for the moment. We are proud to be part of a team that produced a first - a protocol for the translocation of a small carnivore that can be adopted by other organisations. Thank you to our sponsors Mary Skilton, Virbac UK, Pet-ID Microchip, The Reed Foundation and many donors through The Big Give Christmas Challenge 2016.